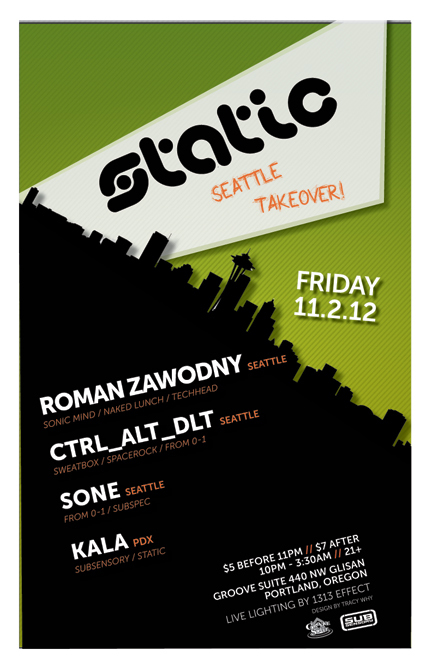 In advance of his headlining appearance on 11-2-2012 at STATIC @ Groove Suite, we had a few words with Seattle-based dj/producer Roman Zawodny. Seattle-based dj/producer Roman Zawodny is a rare beast. 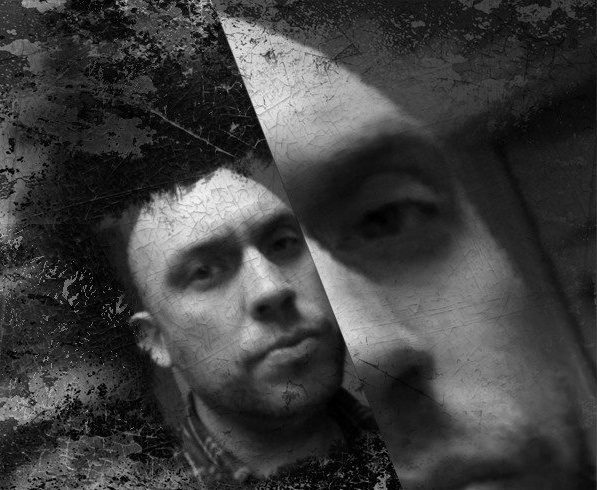 With around 20 years behind the decks and 10 years experience producing his own tracks, Roman has achieved notoriety on the global techno circuit. He’s released dozens of EPs and remixes on labels from around the globe including Yin Yang, Tech-Head, Naked Lunch and Platinum and Urban Kicks. In recent years his music has been played numerous times by techno’ s biggest players, including Dave Clarke, Carl Cox and Derrick May. He was part of the renowned Funky Tekno Tribe at the turn of the century, along with artists like Donald Glaude, Jeno and DJ Dan, and he’s played numerous MASSIVE techno events in London, Toronto and throughout the United States. It’s surprising that we don’t see more of Roman playing on the Pacific Northwest club circuit as of late, the exception being his bookings at several notably large all-ages events. It’s certainly not for lack of talent, personality or the ability to stay current. Roman has all of that and more. However, at the end of the day, some artists choose to keep their heads down, focus on their craft and let the music speak for itself. That’s Roman, and it’s one of the reasons I have such massive respect for him. He thinks big, he plays big and he’s all about the music. So when I decided to put together a Seattle-focused lineup for our November edition of STATIC at Groove Suite, I knew Roman would top the bill. And to introduce, or reintroduce, Roman, we asked him to share a little about himself, his past, present and future. But wait!!!! Before you get started reading this interview, you should hit play on this recent mix from Roman. You’ll need a good soundtrack for this one! How and when did you get your start as a DJ and producer? I started DJing back in the mid-nineties in Seattle…. can’t believe it was that long ago! I was into everything from acid house to techno to drum and bass. My first gig was a rave I threw at the University of Washington in the dorm, not the most likely of places to start but I got quite a few people to show up and I got my feet wet so-to-speak. Then I sent in a tape to C-89.5 and got a one-time chance to spin live on the radio. Legendary Lemon Twist promoter Mike Mercer happened to be tuning in that day. He took a liking to my style and called the radio station interested in having me play his night. That was the beginning of me DJing but not the beginning of my appreciation of electronic dance music. I was clubbing since fifteen at the Depot and Confetti’s in Portland back in the late eighties. Those places planted the seed of techno in my blood. My producing years began in 2003, as I searched within to see what my own soul had to offer the EDM community. At first I collaborated with a few guys in the Seattle area, then felt the need to invest in my own gear and produce on my own time and in my own direction. I had the hunger to make music and was obsessed with it. From 2006 on, I would venture forth as co-label owner of F1 Recordings, then Reldz, Mad Hatter-HRD, and Urban Kickz. Reldz is releasing many of my tracks right now on Beatport, but this is some of my oldest material and doesn’t reflect where I’m at right now…it reflects where I was 6 years ago. My newest tracks would be on labels like Urban Kickz, Yin Yang, Tech-Head, Naked Lunch, Platinium etc. My favorite EP to date was for Donnell Knox’s Sonic Mind label. This Seres EP has an electro/techno track titled Drone that Dave Clarke took a keen liking to, playing it on his infamous radio show WhiteNoise. Dave has supported many of my tracks over the years. Who were some of your early influences? Who influences you today? I love this question. The Acid House and Hip House movements influenced me in a huge way when I was a teenager. Fast Eddie, Tyree Cooper, Mr. Lee, Sundance…I was intrigued by this sound. It’s jacking and it’s underground. Tom rhythms, clever rhymes, and the Roland 303 came together to create a fusion of new possibility. One of the first DJ’s to make a huge impression on me was one of Chicago’s treasures a man part myth, part legend, Terry Mullan. He was sharp, his programming was flawless. The music he played was a combination of house, acid, and techno. He was and still is unstoppable. Terry still influences me today, along with three very dedicated techno pioneers: Carl Cox, Dave Clarke and Derrick May…all of whom I am humbled and grateful to say have supported my work. Derrick even wrote me a nice message saying he played my track Flux at a party in Liege, Belgium. Carl Cox can be seen here rocking Ultra Music Festival with a track I did for Teggno Recordings, titled Substance One. You’ve released on a wide variety of labels. Who are some of the key artists, labels and crews you’ve collaborated with in the past? Who are some of the artists and labels you’re collaborating with today? Relentless Crew from Chicago/Minneapolis: Jerome Baker, James Hammer, Jackie Simons III and yours truly. Each of these producers have their own wicked style. When I hear a track by Jerome I know it’s Jerome. ‘”It’s gotta beat” he always tells me. All genuine and all driven by the music, not by fame or money. These gents are all artists with a common denominator: talent. I’ve particularly enjoyed remixing for techno heroes Angel Alanis and Virgil Enzinger on their Slap Jaxx and I.cntrl labels respectively and I’ve done some work alongside my man Steel Grooves in Austin. Gotta say something about Rex (Steel Grooves)…he’s got tons of raw talent and a selfless attitude that is extremely rare in the music industry. His pride and joy, Capital Techno Recording (CTR) is a superb label that doesn’t hold back…gives it to you just the way it should be so as he would say, “Don’t be scared.” It’s an empowering attitude for creative work. Any new production in the pipeline or releases coming up? What is the most memorable show you’ve played over the years? That’s easy. Off the bat I can tell you that playing in Toronto right after Joey Beltram at the DayBreaks party “Urbanation” July 10, 1999 was amazing. 7000 people showed up to a spot that held 4000…it went off. Dose crew was running things in Toronto at the time, but Ron Rivlin and his DayBreaks company set the bar. Loved playing for him in Toronto and London, Ontario numerous times. You’ve clearly played a lot of shows, but it seems like you shifted your focus toward production a lot more in the past 4-5 years. Can you talk a little about that? You’re right. I have shifted my focus to putting more time in the studio to refine my own sound. It’s critical to contribute one’s own compositions to the global music scene as well as playing other artists’ music as a DJ. Today’s digital music market is saturated with producers, many of whom emulate a similar, if not dead-on ditto approach. Keep in mind it is truly rewarding and normal to be influenced by other people’s productions, as many have done hard work before us to build the foundation of the underground music culture. As a DJ, I’ve heard a lot of diversity from you within the techno genre over the years, whether it’s drum-heavy tribal sounds, high octane industrial-strength bangers, or even house, acid and disco influenced grooves. Can you talk a little about how your sound has evolved? How would you describe your sound today? How does it differ from a few years ago or even 10 years ago? Back around the turn of the millennium I liked to jack it tough pretty much the entire set, chop up the crossfader quite a bit and go for gold knocking ’em over the head. This was effective in its day, but times have changed and so have I. The fidelity of music and the intricacy of productions have gone to a whole new level. Though I still think that some of the best techno and house came out in the mid to late 90’s. I played tracks at 135-138 BPM back in the day. Now I like to keep it around 128-130. There’s an incredible amount going on in terms of melody and effects and I think it’s good to give the music between beats room to breathe. Don’t get me wrong, sometimes I’ll finish up my set in the mid 130’s when I’m in the zone and people are really having it. In terms of my current sound, it depends on the venue and time but generally I like to keep it jacking. There needs to be some tension. See if I can ignite it…. Techno music in general has gone through a lot of shifts in the past decade. What do you think about the evolution of the music? Where do you see those changes fitting in to your own approach? I’m excited to see how the techno genre is covering a wider range of music than ever before. With that in mind, it’s difficult to clearly define where techno ends and tech-house or electro begins. This freedom of movement across and within the genres is breaking molds and giving artists free minds to explore new territory and expand their horizons a bit. The advancements in production software have also enabled producers to put their ideas into their tracks efficiently, no matter how complicated or far-ranging those ideas might be. It’s important to get in there and make every sound count and strive for something unique. Forge your own identity with the tools available to you. Your first Portland club appearance in recent years is coming up at the November 2nd edition of SubSensory’s STATIC party. We’re really excited to hear you in action. What can we expect from you on this night? I’m excited to come back to my hometown of Portland, and in essence come back to my roots. A lot of people have been talking about STATIC and your label SubSensory and it’s a big opportunity for me to connect with the scene there. For my set, expect the unexpected. It will be a night of hot tracks…many by artists across the globe that I think have tons of talent, yet aren’t as well known as they probably should be. I’m going to push some boundaries and test the crowd. Let’s go let’s go!